This paper presents compelling evidence that the central fact of the Pentagon attack on September 11, 2001, is the same as at the World Trade Center: inside-the-building explosives which no foreign terrorists could have had the access to plant, making the official narrative of what happened on 9/11 impossible. Physical evidence and eyewitness testimony converge to show that internal as well as external explosions went off just after 9:30 a.m., when the official narrative claims Flight 77 was still dozens of miles from Washington. The official narrative claims AA77 didn’t approach the building until 9:37:46, or almost 9:38. These primary explosions, also, went off at locations far removed from the official story “plane penetration path” in Wedge One, including in Wedge Two significantly further north and in the two innermost rings far beyond the alleged “exit” hole in the middle or C Ring. The FBI’s code names for terrorist investigations known to have been carried out by means of bombs or explosives end in BOM[B] — for example, the acronym for its Oklahoma City bombing investigation is OKBOM.1 It is therefore highly significant that the official FBI code name for the investigation of the September 11 attacks is PENTTBOM, which stands for Pentagon Twin Towers Bombing. In this acronym, the abbreviation for Pentagon comes first, followed by that for the Twin Towers, with the notable absence of an abbreviation for Pennsylvannia. Robert Mueller, who was FBI director on 9/11, confirmed this to Time magazine: “The [FBI’s] SIOC [Strategic Intelligence Operations Center] filled to capacity on 9/11 and remained that way through PENTTBOM, the FBI’s cryptonym for ‘Pentagon,’ ‘Twin Towers’ and ‘Bombing’], reconfirming Newsweek’s report in the immediate wake of the attacks.2 Despite the clear inference that the 9/11 investigation, the largest in the agency’s history,3 was focused on bombs or explosives, FBI briefers lied to the “Jersey Girls,” whose husbands were killed in the Twin Towers, when they asked why the investigation was called PENTTBOM. They were told that it was because “all the FBI’s investigations [code names] end in BOM.”4 This is provably false; even the acronym for the agency’s investigation of the 9/11-related anthrax letter attacks is AMERITRAX, not AMERIBOM. Further evidence that the FBI knew the core of the 9/11 attacks was bombs or explosives is that the acronyms for its investigations of prior major terrorist attacks known to have been carried out by bombs did end in BOM(B) — for instance, OKBOMB for the Oklahoma City bombing.4a The truth is, the highest levels of the U.S. government know why the investigation of the Sept. 11 attacks was called PENTTBOM[B], have from the very beginning, and made a conscious decision to keep the American people, including more than 6,000 victims’ family members, not only in the dark but actively deceived about what really happened to cause the mass murder of nearly 3,000 of our fellow citizens. Top Defense Department officials, including Secretary Donald Rumsfeld himself, not only expected but were preparing for some kind of attack on the Pentagon on 9/11. Shortly after the attacks, Newsweek reported that on Sept. 10, the day before, “a group of top Pentagon officials suddenly canceled travel plans for the next morning, apparently because of security concerns,”4b and on Sept. 11 Associated Press reported that “the Pentagon attack came [only] minutes after Rumsfeld predicted [having already learned of the attacks on the two World Trade Center towers], ‘There will be another event. '”5 The source for Rumsfeld’s “prediction” was Rep. Christopher Cox, who had been meeting with him in his office before the Pentagon attack. In another version, Cox reported that the Secretary had said, “Believe me, this isn’t over yet. There’s going to be another attack, and it could be us [the Pentagon].”4c Even earlier, before the first attack in New York City, at a breakfast Rumsfeld had called with his senior-most military officers and top civilian Pentagon officials including Deputy Secretary of Defense Wolfowitz and the military service chiefs, he “predicted” that a shocking world event would occur in the near future;4d then just as the breakfast was breaking up, the first WTC tower was hit. As detailed by Professor Graeme MacQueen at the Toronto 9/11 Hearings, more than 100 firefighters, first responders and other eye- and earwitnesses heard and felt explosions inside the WTC Towers in New York City, including at least two dozen reporting massive basement-level explosions in WTC 1 before the first plane hit more than ninety floors above. Similarly, Pentagon eye- and earwitnesses gave testimonies to official Defense Department historians and the mainstream media that they experienced massive explosions at the Pentagon, some more than five minutes before Flight 77 is held by the government’s narrative to have come anywhere near the building. Many other military officers and enlisted personnel inside the building also experienced and reported explosions. Lt. Nancy McKeown, who was in the Naval Command Center on the first floor of the second-in D Ring, said, “It sounded like a series of explosions going off… It sounded like a series of bombs exploding, similar to firecrackers when you light them and you just get a series going off.” This is essentially identical to firefighters’ descriptions of preplaced explosives going off in the World Trade Center towers in New York City on 9/11. McKeown yelled “Bomb!” when she heard and felt a major explosion, after which tiles fell from her office ceiling.7 Lt. Col. Thurman, who was on the second floor of this same second-in D Ring said, “To me, it didn’t seem like a plane. To me, it seemed like it was a bomb. Being in the military, I have been around grenade, artillery explosions. It was a two-part explosion to me. It seemed like there was a percussion blast that blew me kind of backwards in my cubicle to the side. And then it seemed as if a massive explosion went off at the same time.” Army Lt. Col. Victor Correa, who was on the second floor in the Army Personnel area just above the alleged impact point, said, “We thought it was some kind of explosion, that somehow someone got in there and planted bombs because we saw these holes.”8 John Yates, a security manager for the Assistant Secretary of the Army for Manpower and Reserve Affairs who was in the same area as Correa just above the alleged impact point, said, “There was no noise. I mean, I did not hear a plane. Just suddenly the room just exploded, and I was blown through the air.”9 Even a local mayor who was at the Pentagon that morning had a similar experience, reported by the Frederick (Maryland) News-Post. Thurmont Mayor Marty Burns “was leaning against an office doorway when an explosion rocked the Pentagon…Pentagon employees assumed it was a bomb… ‘Where’s the next bomb?’ Burns and his Pentagon colleagues wondered. Even outside the building, Burns saw no indication that a plane had caused the [internal] damage.”10 Lt. Col. Brian Birdwell, who had just come out of a restroom off Corridor 4 in the vicinity of te fourth-in B Ring, said, “I heard the sound of a very loud explosion. In my number of years in the artillery community, I hadn’t heard anything that loud. I thought it was a bomb.”11 And standing outside the Navy Annex about three football fields’ distance from the building, Terry Morin recalled, “I saw the flash and subsequent fireball rise approximately 200 feet above the Pentagon. There was a large explosion noise and the low frequency sound echo that comes with this type of sound. Associated with that was the increase in air pressure, momentarily, like a small gust of wind. For those formerly in the military, it sounded like a 2,000-pound bomb going off…”12 Though Morin had just experienced a large plane fly overhead and to his right along the south side of the Navy Annex, he nevertheless described what the official story alleges to have been an impact, which he acknowledged could not see, with bomb-related references. Army witness April Gallop, who experienced a massive explosion as she pressed the ‘on’ button on her computer in Room 1E517 in Wedge Two off Corridor 5 more than 100 feet north of the official story alleged impact point (see Fig. 1, below), also smelled cordite and thought that it was a bomb. “Being in the Army with the training I had, I know what a bomb sounds and acts like, especially the aftermath,” and it sounded and acted “like a bomb,” Gallop told the author in an under-oath videotaped interview.15 She also restated this in a formal court filing and in a videotaped interview with former Minnesota Governor Jesse Ventura for a TruTV episode on the Pentagon attack aired December 17, 2010.16 The force of the explosion and/or the impact of debris falling upon her stopped her wrist watch at or just after 9:30,17which is almost 8 minutes before the official story claims Flight 77 came anywhere near the building. Though cordite produces a strong detonation shock wave, it is cool burning, which would explain why Gallop experienced a major explosion and yet remain unburned (see Fig. 2, second below). Fig. 1. Above, graphic from the Pentagon Building Performance Report showing the boundary between Wedge 1, where the official story claims a 757 impacted at 9:37:46 at Column 14, and Wedge 2 to the left/north. Wedge Two is where April Gallop and dozens of co-workers experienced a massive explosion inside the outer E Ring at or just after 9:30, almost 8 minutes earlier and more than 120 feet from the alleged impact point of a plane. 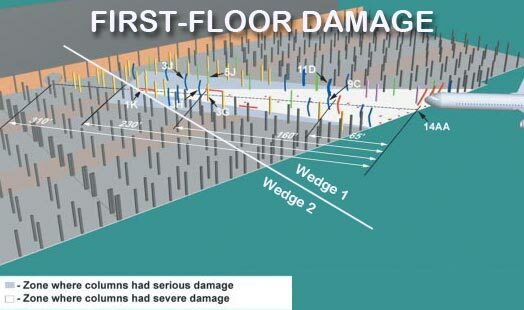 This graphic depicts the false claim, proven by Gallop’s and other testimony, that almost all – the Building Performance Report claims 90 percent — of the primary internal damage (white area) to the outer E Ring was only in Wedge 1. Fig. 2. Army survivor April Gallop rests on the Pentagon lawn after having lost one of her shoes while escaping the destruction from an explosion that went off near her desk in Wedge 2 at just after 9:30. The official story claims that she exited through the alleged entrance point of a plane and through a raging inferno consuming over 11,000 gallons of remaining jet fuel, yet Gallop was unburned, including on the bottoms of her feet. Her infant son is being held by the man kneeling on the left. Multiple, independently set electric or battery-operated wall clocks in areas of the Pentagon that sustained major damage — including one outside the main building in the heliport fire house off the west wall — were stopped by explosions shortly after 9:30, when a plane the official story claims was Flight 77 was still dozens of miles from the area. The Navy, whose Naval Command Center was destroyed by an explosion (see below), immediately posted a photo of one of these wall clocks, stopped at 9:31:40 (right-hand clock in Fig. 3, below) on an official DoD website, and the heliport firehouse clock, stopped at 9:32:30, is in the official 9/11 exhibit at the Smithsonian Institution National Museum of American History (left-hand clock in Fig. 3, below).20 The photo caption on its website states that “the blast” from the Pentagon attack “knocked the heliport clock from the wall, freezing it at 9:32,” and yet the official story claims that a plane didn’t approach the building until almost 9:38. Fig. 3. Some of the west section Pentagon wall clocks stopped shortly after 9:30 on Sept. 11. consistent with the early media reports (see below). The clock on the left, from the heliport firehouse located outside the west wall, is in the Smithsonian Institution’s 9/11 exhibit. Clearly, if major violent event(s) caused destruction at the Pentagon shortly after 9:30, the official story that Flight 77 struck the building at 9:37:46 – almost eight minutes later — cannot be the whole or even the most important part of what actually happened at the nation’s primary military command center on Sept. 11.